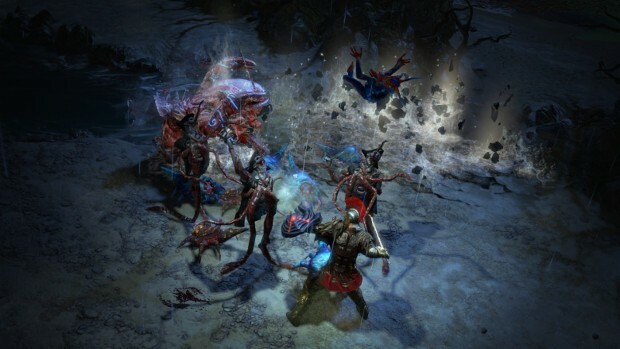 Path of Exile is a dungeon-crawling roleplaying game that will look and feel very familiar to anybody who has ever played Diablo. NPCs in Path of Exile are pretty standard for ARPGs. Most of the NPCs are in town and act as quest givers and merchants. There are also a number of nasty creatures in the game, all of them Enemies, and out to kill you. Unique (gold) mobs which are essentially bosses with special and often unique abilities (there are currently 53 Unique Bosses in the game). If the game feels too easy at the beinning, don't you worry, the enemies get very nasty later on in higher difficulties. Groups of blues to be the most dangerous overall because of their enhancements paired with the fact you can encounter substantial groups of them. One thing I like about this game is the behavior of the monsters. The animations and actions tied to their special abilities (such as charging or jumping or laying eggs) is very well done, and it’s quite satisfying to shatter cold enemies, destroy those pesky octopus creatures which seem to cover the ground, and crumble the living statutes. You will quickly learn what different monsters can do, which includes learning how to avoid their nasty abilities. One of the first nasty attacks agile players are exposed to is Puncture which causes you to bleed/lose hits profusely if you move around while afflicted. Monsters can also carry with them inherit resistances which can make them challenging for certain builds. There’s nothing worse than specializing in lightning magic and running into a room of lightning resistant monsters that do high damage and are blue (thus enhanced). But that’s part of the fun of the game. The other thing is the bodies (or what's left of your victims) stay all of them. They don’t disappear until you load a new version of the zone. Be wary of Necromancers and other monsters that can raise the dead; there’s no limit to the number they can bring back! Another thing good about Path of Exile is the wander radius of monsters. More often than not, right in the middle of combat, another group of creatures will come out of nowhere, as if they’re drawn to the sounds of combat. One must also be very careful leaving an unattended character as PoE has mobs which like to wander. If you think you’re safe because you cleared the mobs out around your area and get up to get a drink, by the time you return, you might be dead. It’s also important to point out monsters will use the very same skills you do. They will curse you, cast frost pulse, shock, fireball, and cleave you and anyone who fights with you. Of course, if you want to buy cheap PoE orbs, you can not hesitate to enter our website: www.u4gm.com. And you will be very glad to do so.